Illinois State’s international students and visitors create long-lasting connections between nations. 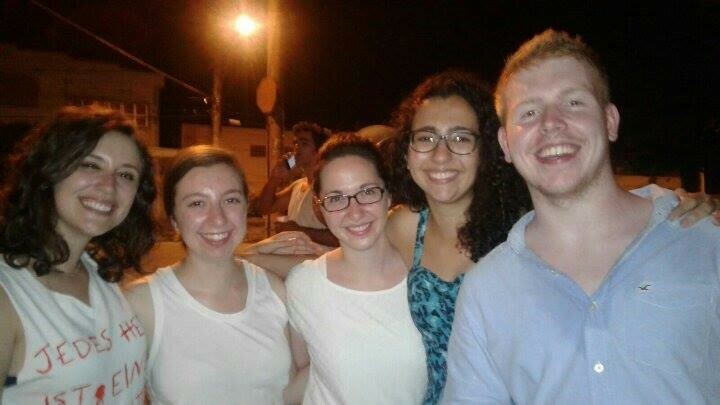 Student Abbie Kuntz tells her story of a friendship that lead her to Brazil. According to the Office of International Studies and Programs, 341 international students studied on campus last year. Some international students come for a semester, while others come for a year. There are also additional international visitors who are studying at the English Language Institute (ELI). This year, for example, we have 24 teachers from Panama who are studying at the ELI, an intense 8-week program that ends in March. Last December, Abbie Kuntz, a graduate student in the Speech Language Pathology Graduate Program, visited Brazil to reconnect with her friend, Beatriz Da Costa, a former international student at ISU. Kuntz talked of meeting DaCosta, staying in touch, and the meaning of her trip to Brazil. I met Beatriz in the Spring of 2015 through International Talk Time, an RSO here on campus for international students. We also had mutual friends, so we knew each other in multiple contexts. It wasn’t long before we became good friends. Once Beatriz left, how often did you talk? How did you keep in touch? We actually talked almost daily via the text messaging service Whatsapp. It’s free and many internationals use it as their primary service. We skyped on occasion as well. It was nice to be able to chit-chat about day-to-day life as well as to catch up in more depth. Beatriz and I are the type of friends that hit it off right away, or what you could call “soul sisters.” That said, we needed each other and ongoing communication was natural and heartfelt. Tell me how this trip came into existence. We had talked about visiting each other again sometime in the future. I had recently traveled and wasn’t planning on taking any trips, but when a mutual friend went on a spur of the moment trip to visit her in Brazil, it seemed more of a reality. As Winter break 2015-2016 approached, I started talking with some friends about a break trip. In the end, we decided to go big and visit Beatriz, and we [Fellow traveler: ISU student Mary Beth Redden] ended up finding tickets within our price range and were able to go on the trip. From there, we planned the trip with Beatriz – which ended up being a vacation for Beatriz as well-and the rest is history! The “Normal” Kids – Tati Sousa, Mary Beth Redden, Abbie Kuntz, Beatriz Costa, J.D Lewis. Tell me what impressed you most about Brazil. Brazil itself is a unique place. We visited Rio de Janeiro, Belo Horizonte, Paraty, and Trindade. Portuguese is the main language. Communicating in Portuguese was difficult but a great learning experience. As a student in the Speech Language Pathology graduate program, I am intrigued about how people learn language(s). My favorite part of traveling is developing a perspective gained only by visiting a new place and trying to understand it. Also, this trip was unique in that it was about reconnecting. Not only did we get to visit Beatriz and meet other Brazilians, but we got to experience a bit of ISU community in Brazil. Another former international student, Tati Sousa, hosted the New Year’s party we attended. ISU student, JD Lewis, was also in attendance. So in total, there were five of us. It was a bit surreal of an experience to be reconnected so far from ISU. Would you recommend ISU students to travel to Brazil? I would definitely recommend it, but also to travel in general! It changes your perspective about the world and life! Brazil itself would love to have you! You can travel there fairly easily, as they have lots of public transportation, which is cheap, but it does take some figuring out. However, the local people are very friendly, and I’m certain that your accommodation hosts would be of excellent assistance — be sure to check out some of the hostels. In the end, go for it! Kuntz is a graduate assistant in the Latin American and Latino Studies Program at Illinois State.